Adams Auto Group - Family owned and operated for over ten years! Buy here pay here, bad credit, no credit, unemployment, disability, SSI, previous repossessions, job letters/bank statements, bankruptcy (chapter 7), first time buyers, foreclosure, cash income, you drive!!! If you are in a difficult financial situation and need to improve your credit score, let us here at Adams Auto Group assist you with an affordable, reliable vehicle. Our customers are our top priority and your complete satisfaction is guaranteed. We offer warranty on all our cars up to two or more years!! We have the most aggressive pricing in the north east. Unlike traditional buy here pay here, we will help you build your credit. We report to all three major credit bureau (they do not). We offer similar payments but on newer more valuable vehicles (they cannot) We take pride in our vehicles, our cars go through a rigorous nine point inspection in our new prestigious service department. 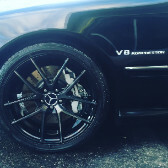 Our nine point inspection goes through every nook and cranny of our vehicles to ensure that they are quality vehicles: engine oil, transmission oil, brake discs, brake pads, and brake fluid, battery, suspension, all lights, and emissions. Our cars are guaranteed to pass New Jersey state inspection. Come stop buy today!!!! We speak English, and Spanish. Check, all major credit cards, and financing available.